Let me rephrase that. I love GOOD meatloaf. Growing up my mother would make a giant meatball, with lots of Pecorino Romano and breadcrumbs, covered in tomato sauce sometimes, surrounded by peas other times. If there were any leftovers to be had it made a fantastic sandwich, on crusty sesame sprinkled semolina bread smothered in melted mozzarella. 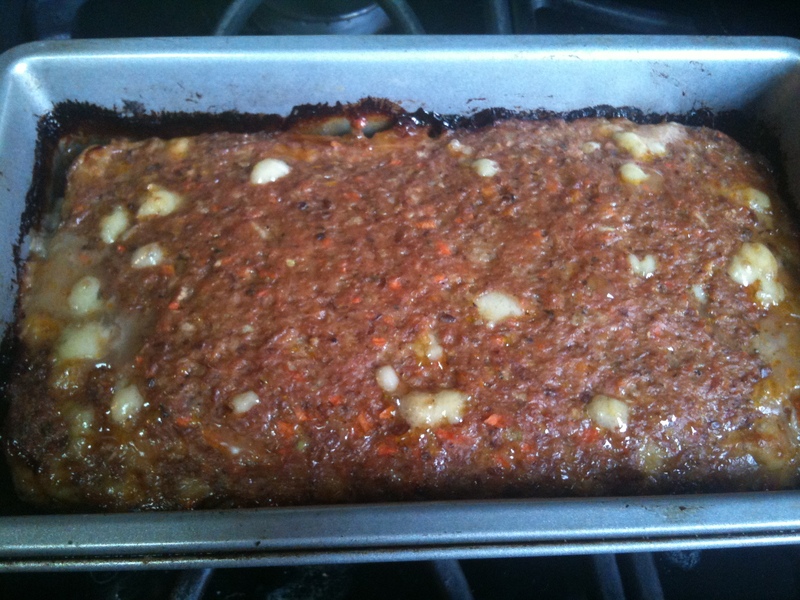 Nowadays my meatloaf has evolved, as it’s a great place to hide veggies from a finicky toddler. The addition of ground flaxseed gives it a nuttiness and adds nutritious omega 3’s, a compound found in oily fish, like sardines, that we don’t get enough of in our diet. Omega 3’s also contain DHA, which expecting moms know from taking prenatal vitamins, is essential for a child’s brain development. Flaxseed also contains fiber, and other compounds that have been thought to fight cancer. Using grass-fed beef as opposed to conventional beef also makes it much healthier for you. Cows are ruminants, which are animals that have a second-stomach like organ that enables them to digest grass, something humans can’t do. Conventionally raised beef isn’t fed grass, in fact, they are raised nowhere near grass, and eat corn and other manufactured meal (which we won’t speak of) instead. This results in a fattier, unhealthy cow. Because the animals aren’t eating all that chlorophyll goodness that they are supposed to, the meat is higher in cholesterol and not nearly as nutrient dense. If you would like to read more about it I recommend Michael Pollan’s The Omnivore’s Dilemma. Anyhow, good meat isn’t cheap, but ground beef is on the lower end of the spectrum so it’s a regular part of our meal rotation. We make many different kinds of meatloaf depending on the season and our moods. This recipe is made with just carrots, onion, and celery, which is classic mirepoix. In the summer I will sometimes make it with diced bell peppers and zucchini or even jalapeño to give it spice. I had Gruyère in the fridge, as I often do, so that is what I used. It’s not necessary though. Grated Parmigiano Reggiano is a fine substitute. Worcestershire sauce and tomato paste give it the acidity and sweetness that people usually use ketchup for. I use a homemade Worcestershire-like sauce that my friend Jori Jayne Emde makes called #4 sauce that doesn’t have any weird ingredients in it. You can read more about it here. Balsamic Vinegar does the same sort of job if you need to substitute. We usually make a pound of meat at a time for the three of us but it is gone in a night and we are being deprived of those coveted leftovers we spoke of earlier. I’ve upped it to two so we’ll see how that goes. We’ve made it work to feed four with an abundance of delicious sides. 2. Rough chop carrots, onions and celery and pulse separately in food processor until fine but not pureed. I like to do them all separately because you have more control that way. However my machine is very small. If yours is very large you can add them all together and just pulse in spurts until chopped but not pureed. Garlic can be smashed with the side of the knife, skin removed and chopped with the onion. 3. Add vegetable mixture to bowl. 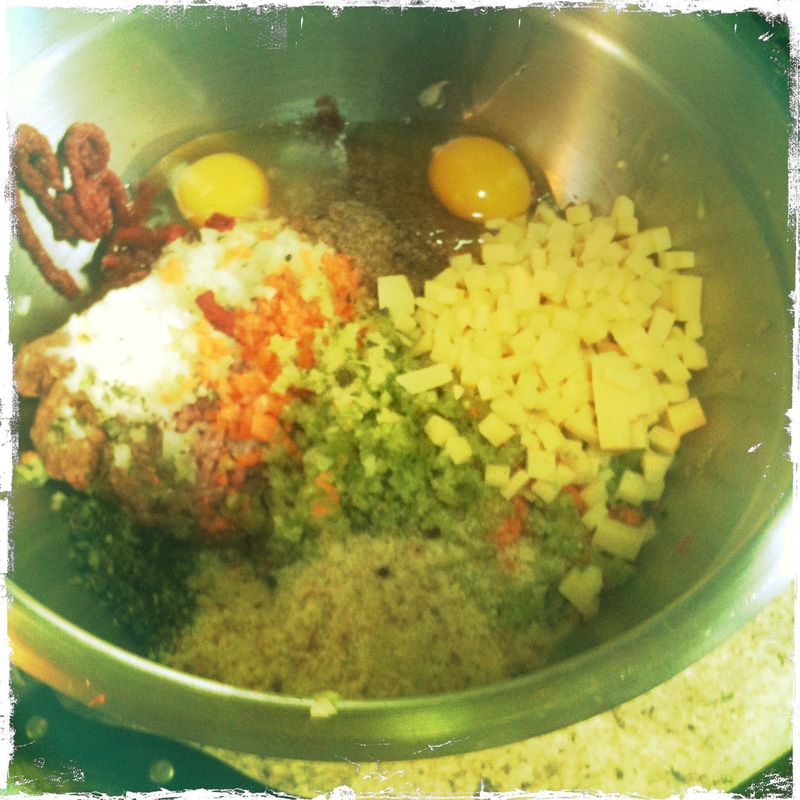 Add all remaining ingredients and mix. Season with Salt and Pepper. I like to mix with a gloved hand so that you are sure everything is really incorporated. Also, you want to make sure you have mixed it until it all starts to bind together. Mixture will become assimilated and sticky to the touch. 4. In a small sauté pan cook off a tablespoon of the mix in a drop of oil to check for seasoning. This is an important step. Any time I make any kind of ground meat recipe (meatloaf, meatballs, sausage etc.) I always cook some off because if you don’t have the mixture perfectly seasoned and you cook the whole thing, you are screwed. 5. Season with salt and pepper and taste again. Do this until it’s where you want it. 6. Press mixture into a loaf pan or a corningware. Most people make meatloaf on a flat cookie sheet. When you do that the fat and juices tend to run out of the meatloaf leaving it dry, and your pan burnt. If you put it in some sort of mold, you contain all of the liquid. The juices reduce and leave the flavor concentrated in the meat and the whole thing sort of cooks in the fat leaving it moist and delicious. 7. Bake at 450 for about 35 minutes. I make it in a loaf pan. But different factors affect the cooking time like the pan you use, (if you use a wider, flatter pan it could take a shorter time or pan material) or the calibration of the oven. Meatloaf should be cooked through, without pink inside. You want to cook it to about 155 degrees on an instant read thermometer. Then take it out and let it rest for about 10 minutes where it will continue to rise in temperature (called carry-over cooking) and the juices will redistribute as it cools. 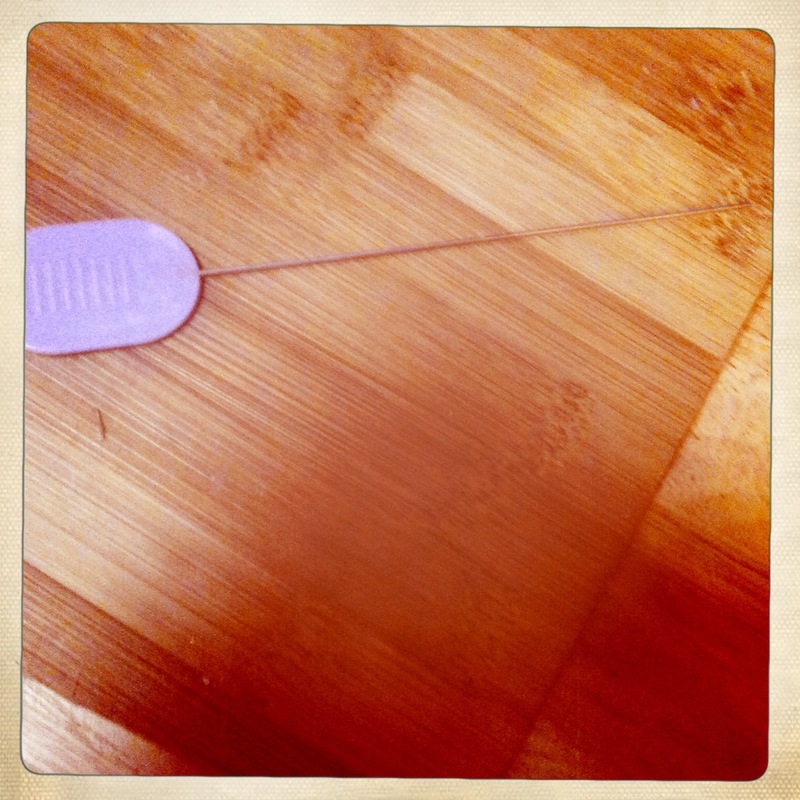 If you don’t have a thermometer insert a paring knife into the center and hold it there for a few seconds. Then touch the knife to your bottom lip. If the knife feels hot to you, it’s cooked. Body temp is 98.5 degrees. If the knife only feels warm, it’s probably about 120 and needs to cook more. Ironically enough there was an Alton Brown chopped meat special on last night and there are a lot of similarities between your meatloaf and his- veggies and the like- but the difference is he said don’t use a loaf pan because you want the fat to drip off and I also believe he suggested a low temp- like 325 for 40 or so minutes. You know I believe anything you say when it comes to food- but I had to wonder because of the opposite-ness. Wow that’s great! I didn’t see the special. I do love me some Alton Brown and usually agree with the things he is saying but I’m going to have to disagree on this one. I prefer the outcome when you cook it in a loaf pan and contain the fat. However I am using grass-fed beef and not conventional beef which is generally fattier. From a health standpoint, if you are watching your fat intake you want to get rid of as much as possible, thus the flat pan and letting it run out. In my opinion, however, there are much worse things that people eat on a regular basis than grass-fed beef fat. Along with the fat running out you lose juices as well which have so much flavor in them, and I hate when meatloaf is dry. If you are concerned with fat intake and cholesterol than it might be a good idea for you, but my personal belief is that if you eat as many whole, non-processed foods as possible, plenty of vegetables and higher quality meats and fish (i.e. animals not fed things they should never eat in the first place- like farmed salmon fed corn!) you can afford yourself a little fat in your meatloaf because you cut it out in other places. As for the temp, his is lower because of the flat pan, a higher temp is needed to evaporate the juices off of a higher sided pan because of steam build up around the sides. I also love the caramelization you get on the top from the higher temp. I have made it with the flat pan and lower temp but I just like the outcome better with the high sides, high temp. You may disagree. Hope this helps to clarify! You know how I love fat! He wanted me to grind my own meat too- not likely. I recently got grass fed beef for burgers and felt it had a different texture- chewier than the “regular” beef I get. I am going with you and the loaf pan! I like carmelization, fat, and easy clean up! I LOVED the last meatloaf you made for us and it was with a pan with high sides. It made it much juicier and more flavorful. Question- how you can be assured you’re buying grass fed beef as opposed to regular? Is it available everywhere? Grass-fed beef is labeled as so. I’ve also seen “Organic” beef labeled that I asked and did research and found to be grass-fed. But I wouldn’t bank on “Organic” automatically meaning grass-fed. You can find it in specialty supermarkets- I know Fairway and Whole Foods carry it, Farmer’s Markets can have it too depending on the season and where the farms are located. Food Co-ops usually have grass-fed beef. USDA Prime has nothing to do with grass-fed, or even quality. It’s an indication of the marbling or fat in the meat. More marbling is Prime, less marbling is Choice. It’s still the same corn-fed, factory feedlot raised cows.